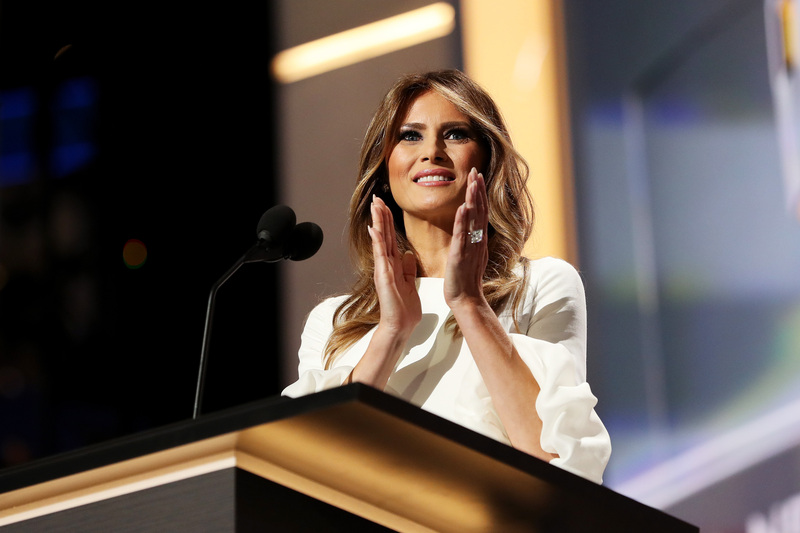 On Monday evening, Melania Trump, along with those who assisted in crafting her RNC speech, committed a gargantuan faux pas the Internet is refusing to sweep underneath the rug. After applause for Melania's impressive speech died down, suspicions arose that she plagiarized Michelle Obama's DNC speech from 2008. Hours later, the "Famous Melania Trump Quotes" hashtag began trending on Twitter, proving that scandal is rarely a stranger to the Trump campaign, even on one of its most pivotal nights. In an interview with Buzzfeed, Jon Favreau, a former speechwriter for President Barack Obama, implied that plagiarism doesn't happen accidentally. He blamed the blunder on Melania's speech writers, though she has claimed in the past to have written the speech herself. Even if that was the case, however, the fact that professionals proof-reading her primetime address didn't recognize the problem is mind-boggling. A stray line or phrase could be a mistake. Two full paragraphs from the current First Lady is just incomprehensible. I can’t believe someone would do that to her. After Gawker published a video comparing snippets from both Melania's speech and Michelle's 2008 speech, the word-for-word similarities spelled bad news for the potential first lady. And with that, Twitter flew off its hinges. Some Twitter users began attributing random quotes to Melania in response. Others took it much too far, turning the hashtag into a full-fledged mockery of her stated hardships. Those inconsiderate tweets are not included in the following list because intentional humiliation is never okay. The fact that Melania and her speechwriters could have copied words from the wife of the GOP's biggest rival — President Obama — is just a bit ironic. And according to a tweet by Favreau, the woman who wrote Michelle's speech used to write speeches for Hillary Clinton — the GOP's other biggest rival. People are really latching onto this one. The hashtag can basically be applied to any quote. With all of the "Pokémon Go" ranting and raving, this one was to be expected. The last one is just bizarre. Other references include Drake and Beyonce. When Oprah promised new cars, she delivered. Will Trump live up to Melania's characterization of him?